The FA Project is committed towards creating awareness of Friedreich's Ataxia, a life altering disease. We aim to educate the public by increasing the visibility of related information & resources and creating a support system for those afflicted with FA. Ultimately it is our goal to provide those living with FA the tools and resources necessary to lead the best life possible. The FA Project is a 501(c)(3) Charitable Organization established in Massachusetts. Our goal is to raise awareness and funds to benefit those affected with Friedreich's Ataxia. 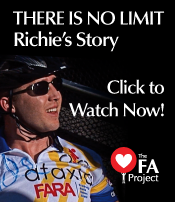 Don't miss the amazing story of Richie Currier, a man living with Friedreich's Ataxia, a debilitating, degenerative neuro-muscular disorder. This video explores the journey of his determination and commitment to a healthy lifestyle, family, support, and survival. Anna is a Registered Nurse in the Pediatric Intensive Care Unit at Massachusetts General Hospital. MGH is one of the largest teaching hospitals in Boston. Before starting at MGH, Anna worked at Sports Medicine North and Union Hospital while in Nursing School. Anna attended University of Hartford, studying Biology and Salem State College graduating with a Bachelor of Science in Nursing. Anna grew up in Nahant, MA. Living there until 2010 when she moved to Winthrop with her husband Rich. She was introduced to Richie, Maria and the rest of the FA Project team at Rich’s tenth high school reunion. Thanks to her husband, Anna was introduced to Candlepin bowling and became a fan. After meeting Richie and the FA Project she shared in her husbands enthusiasm to help the project with a bowling fundraiser. After helping to plan her first fundraiser she was hooked and is looking forward to being involved in many more events for the FA Project. As event director of the annual bowling fundraiser, Anna’s role is to make each event bigger and better than the year before and to spread the work for a good cause to end those suffering with FA. You can connect with Anna at any time at alimone@thefaproject.org.